William George Norris, known as George, was born in early summer 1899 at Salt Hill, Farnham Royal, the son of Henry and Ellen Norris. His father Henry, a plate-layer (on the railway) and general labourer, had been living in Hanwell, Berkshire, with his parents George and Ann Norris and five siblings. In 1897, aged 24, Henry married 20-year-old Ellen Eliza Lyford from Reading, one of at least 10 children born to James and Mary Lyford. In 1901, Henry and Ellen were living at Hughes Cottages, Farnham Royal. George was a two-year-old toddler, and he had a baby sister, Ellen, just two months old. By 1908, Henry and Ellen had moved with their young family to 2 Carter’s Cottages, Salt Hill. Nine-year-old George was on his way to school one morning when the Royal Horse Guards came past, exercising their horses. 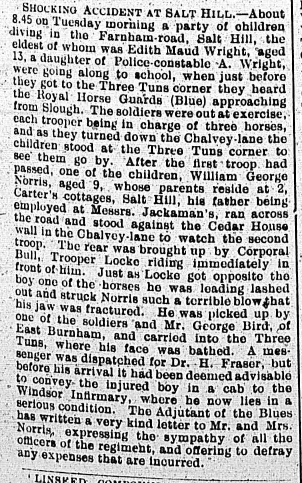 George stood watching them in Chalvey Lane, when one of the horses lashed out, fracturing George’s jaw with its hoof. The injured boy was taken to Windsor Infirmary where he was said to be in a serious condition. The local newspaper recorded the alarming incident, right. At some point after 1915, the Norrises moved to Atkins’ Cottages, Datchet Common. The cottages have since been demolished but used to stand on Workhouse Road, now Holmlea Road. George had just turned 15 when the war started in July 1914. He enlisted in Aylesbury the following May, around his 16th birthday. His military forms state that he was resident in Slough. Official government policy was that men had to be 18 to sign up and 19 to fight overseas but at the time most people didn’t have birth certificates so it would have been easy for George to lie about his age. It didn’t help that recruitment officers were paid for each new recruit, and the medical checks were simply to prove fitness. If underage boys met the height and chest-size criteria, they were very likely to be let through. 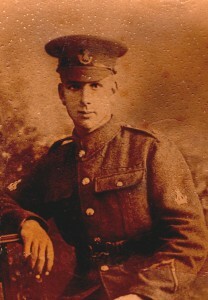 George joined the Bucks Territorials, (Oxfordshire & Buckinghamshire Light Infantry) as Private 3636. George served with OBLI for nearly three years, then in February 1918 he was attached to the 8th Battalion (infantry) Machine Gun Corps, MGC, as Private 138783. 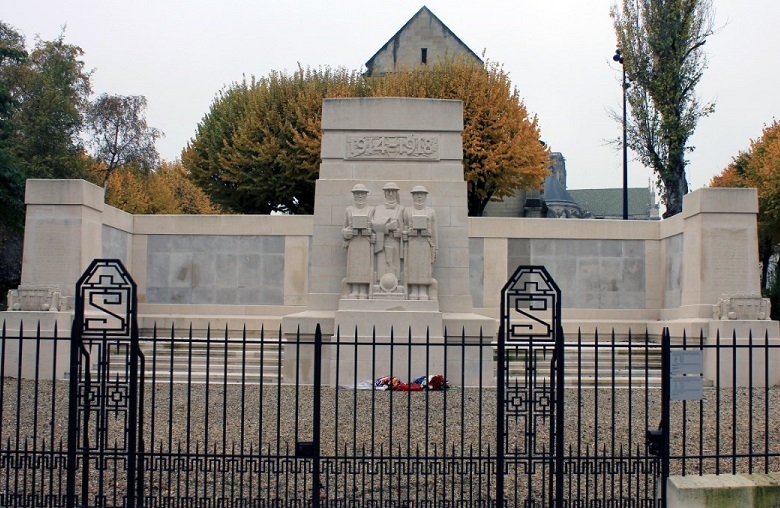 He was the only man on the Datchet Memorial to serve in the Machine Gun Corps. It is said that the MGC starved the line regiments of recruits, taking the fittest and the best to try and satisfy the demand for more and more young, intelligent men to man the guns. The men who served in the MGC were the bravest of the brave, members of what was known as ‘The Suicide Club’. A total of 170,500 officers and men served in the MGC, of whom 62,049 were killed, wounded or missing. At the outbreak of war, the tactical potential of machine guns had not been fully appreciated. Each infantry battalion had its own machine gun section with two Maxim guns. It soon became clear that the machine guns needed to be used in larger units and operated by specially trained soldiers. And so the guns and gun teams were taken from the battalions to create a specialist Machine Gun Company in each infantry brigade. (They were replaced at battalion level by the light Lewis machine guns.) From October 1916, these Machine Gun Companies were then brought together to create the Machine Gun Corps. The speed at which this happened depended largely on how quickly Lewis guns could be supplied but the transfer was complete before the Battle of the Somme in 1916. In April 1918, the 8th (Infantry) Battalion MGC was attached to the 8th Division. They had been engaged in the Second Battle of Villers Bretonneau on 24-25 April as part of III Corps, Fourth Army. During the battle, the German army had deployed 14 of its 21 A7V tanks, making it one of the biggest uses of German tanks in WWI. The first tank-versus-tank battle in history occurred when a group of three advancing German A7V tanks met and engaged three British Mark IV tanks. After this battle, the 8th Division was attached to IX Corps and sent to join the Sixth French Army to rest and reform. It was about this time that George Norris joined them. He was sent to France on 17 May 1918. Instead of resting, the soldiers found themselves the target of a German offensive. George had been in France for just 10 days when his battalion was engaged at the Battle of the Aisne, from 27 May to 6 June. The IX Corps found itself facing an overwhelming German attack which, despite fierce opposition, pushed the Allies back across the Aisne to the Marne. There is an account of this battle on the Wetherby War Memorial website which traces the experiences of Lieutenant Kenneth George Kelly, also of the 8th Battalion MGC: “At 1am [on 27 May 1918] as a ground mist enveloped the landscape, over 6000 guns of all calibres and about 3500 trench mortars commenced what is commonly acknowleded as one of the heaviest bombardments of the Great War by any combatant country. Along the whole of the front occupied by IX Corps, the men were subjected to this maelstrom of steel, bomb and gas, the latter requiring the men to don their gas masks to avoid asphyxiation by chemical agent. The rear areas comprising of battery positions, battalion headquarters and all associated reserve locations were also bombarded with high explosive and gas resulting in the loss of communication almost immediately with the ‘Outpost’ Line. In the ‘Battlezone’, known positions to the Germans of British and French artillery batteries were subjected to heavy shelling, in particular the use of gas followed by barrages of high explosive.” To read more, click here. George was severely wounded. He died, age 19, on 31 May 1918, just a fortnight after arriving in France. The 8th Battalion MCG lost 23 officers and 396 other ranks, in this battle alone; 31 animals were killed and another 47 wounded. They also lost 54 guns, 19 limbers (two-wheeled carts), a general service wagon and a cooker wagon. Having suffered 15,000 fatalities, IX Corps was withdrawn from this front in early July. The news of George’s death doesn’t appear to have reached his family until two or three months later. Datchet Parish Magazine published a short note of condolence in its August issue. George was awarded the Victory Medal and British War Medal. William George Norris doesn’t have a known grave. He is remembered on the Soissons Memorial. The town of Soissons stands on the left bank of the River Aisne, 100kms north-east of Paris. The Commonwealth War Graves Commission website explains that the memorial commemorates almost 4,000 officers and men of the United Kingdom forces who died during the Battles of the Aisne (27 May-6 June) and the Marne (15 July-5 August) in 1918 and who have no known burial site or their burial site cannot be marked individually, or has become inaccessible or unmaintainable. George is remembered among a list of names on stone number 34A. Thank you for this article about George William Norris. He was my Mother’s Uncle. (My great Uncle) After he was killed my Mother was asked to take flowers each year and place them on the cenotaph at Datchet Green. This she was asked to do by her Grandmother (George’s Mother). William was never forgotten by his parents and when his Mother was dying some of her last words were ‘ I will now be reunited with my Billy’. I have gained a lot of information from this item.